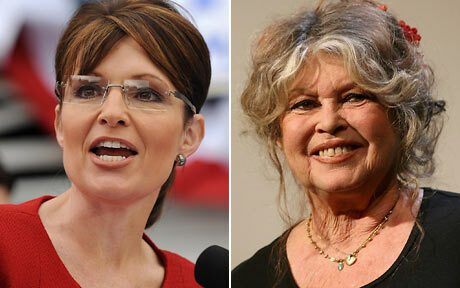 Brigitte Bardot, the great and deeply-respected philospher and definer-of-civilisation, badmouths Sarah Palin…. Which one would you rather go to bed with today? You can read all the guff if you want, but it’s rather like being asked if you want to shag Elizabeth Taylor – you can decline, since you know exactly what it will be like. Poor sad old BB. She was lovely in 1965 when I saw a pic of her in a confiscated mag at school, lying on her tum, in a bikini, rather small (the bikini, not BB). The pic was about seven years old which would have made her, say, 24….yep that would be it. It’s so sad, what happens to the human body with age, such a beautiful thing that it once was. Forget it, BB, get a life, just keep on upsetting the French Nazis, who fine you thousands periodically for saying things about animal rights and gays and stuff…that’s your job, and you can afford it, and you are good at it. Just keep Nicolas-Psychosis busy, for then he can’t do any worse stuff to people. Do what you do, and move on. The (democrat) Nazis in the USA would eat you for breakfast, so keep out of it, for old times’ sake, OK?